The nakshatras are the apparently fixed bodies in the Zodiac, where the planetary system moves with them placed in the background. Among the Rasi and the nakshatras, the former is overlorded by the Sun, whereas the latter is overlorded by Moon. This implies that the Rasi shows the environment we would be placed with at different times in our life and what we get out of it, on the other hand, the nakshatras govern the different state of mind we shall be having at various times. Even the actual events are important in our life, taking a person-centric view point; our reactions to them also matter equally. Hence the study of the nakshatras is well warranted. There are two nakshatra schemes, one of which uses 27 Nakshatras and the other uses 28 nakshatras, which include the Abhijit Nakshatra, an intercalary nakshatra. Both the schemes are useful in their own right. While 27 nakshatra scheme is used for all day to analysis, such as analysis of birth chart, analysis of dasas, using Navatara chakra etc; the 28 nakshatra scheme is used for analysis of few chakras such as sarvatobhadra chakra, the sannadi chakra etc. The Nakshatras are reckoned from beginning with Aries which coincides with the beginning of Ashwini. There are four padas (quarters) of each nakshatra, each measuring 3d 20m making the total duration of the nakshatra to be 13d 20m. Thus there are 108 padas across the zodiac and each map to 1 Navamsa. However, since the duration of 1 sign is 30 degrees, the nakshatra cannot be mapped exactly on the Rasis. However, it is interesting to see that 9 nakshatras can be mapped to 4 Rasis. 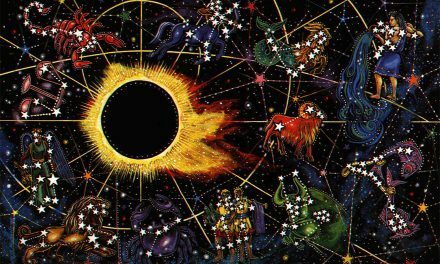 From this we can derive the basis of dividing the zodiac of 12 Rasis and 27 nakshatras into 3 parts each measuring 120 degrees. This is the basis for the Navatara Chakra, where the nakshatras are divided into three groups of 9 each, starting either from the Janma or Lagna Nakshatra. 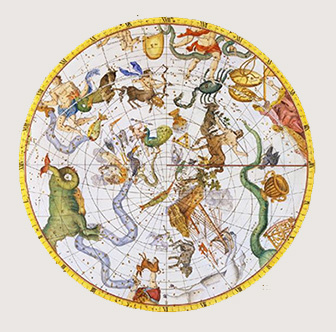 While we see the mapping of the 9 Nakshatras on 4 Rasis, we see that there are few nakshatras which would fall across two Rasis such as Krittika, which falls in Aries and Taurus; Mrgashiras, which falls across Taurus and Gemini and so on. There are others which would fall in 1 rasi such as Ashwini, Bharani, Rohini etc. Even though this looks haphazard and erratic, there is a hidden meaning behind it. To understand the meaning, we need to know the tattvas (primordial elements) ruling the Rasis and the Nakshatra padas. Beginning from Aries, the Rasis are ruled by Fire, Earth, Air and Water in a cyclical manner. Thus Aries, Leo and Sagittarius are the fiery signs; Taurus, Virgo & Capricorn are the earthy signs and so on. This is the same pattern which repeats for the nakshatra padas, which means that the first pada is governed by fire element, 2nd by earth, 3rd by air and the 4th by water. This cycle repeats across the nakshatras. The beauty of the mapping of the Nakshatra with the rasi is that, among the 9 nakshatra padas which fall in a rasi, the tattva of the first and the last pada belongs to the tattva of the sign. So the first and last pada of Aries would be Fiery, the first and last pada of Taurus would be Earthy and so on. Seeing this from another perspective, the while seen among the three groups of 4 signs (starting from Aries, Leo and Sagittarius), the 1st sign starts from 1st pada of a nakshatra and ends with the 1st pada of a nakshatra (for example, Aries starts with 1st pada of Ashwini and ends with the 1st pada of Krittika). Similarly, the 2nd sign (Taurus, Virgo, Capricorn) start with 2nd pada of a nakshatra and end with the 2nd pada of another nakshatra (for example, Taurus starts with 2nd pada of Krittika and ends with 2nd pada of Mrgashiras); 3rd sign Gemini starts with 3rd pada of Mrgashiras and ends with 3rd pada of Punarvasu and the 4th sign Cancer start with 4th pada of Punarvasu and end with 4th pada of Aslesha. The lordship of each cycle of 9 nakshatras, as per Vimshottari dasa scheme, starting from Ashwini is Ketu, Venus, Sun, Moon, Mars, Rahu, Jupiter, Saturn, Mercury. It is worthy to note that the 3 of the 9 nakshatras, which fall in the junction of signs (rasi sandhi), are ruled by Sun, Mars and Jupiter, the three best friends on the Deva’s side! The other Nakshatras which fall inside the signs are ruled by Ketu, Venus, Moon, Rahu, Saturn & Mercury. What can be made out of these two categories of the planets? Rohini, Uttar-phalguni, Uttar-ashadha and Uttar-bhadrapada are supposed to be fixed nakshatras and they are favourable for activities which are related to establishing something permanent such as coronations, laying the foundations of cities, sowing operations, planting trees. Chitta, Anuradha, Mrigasira and Revati are soft nakshatras. They are favourable for soft or artistic activities such as wearing new apparel, learning dancing, music and fine arts, sexual union and performance of auspicious ceremonies. Ashwini, Pushya, Hasta and Abhijit are light nakshatras, and they are favourable for light and sportive activities such as putting ornamentation, pleasures and sports, administering medicine, starting industries and undertaking travels. Moola, Jyestha, Ardra and Aslesha are sharp nakshatras in nature and they are favourable for sharp, piercing and painful activities such as incantations, invoking spirits, for imprisonment, murders, and separation of friends. Sravana, Dhanishta, Satabhisaj, Punarvasu and Swati are mobile nakshatras and they are auspicious for mobile activities such as acquiring vehicles, for gardening and for going on procession. Purva-phalguni, Poorvashadha and Poorvabhadra, Bharani and Makha are dreadful nakshatras and they are favourable for nefarious schemes, poisoning, deceit, imprisonment, setting fire and other evil deeds. Krittika and Visakha are mixed nakshatras and during their influences, works of day-to-day importance can be undertaken. Beginning from the third quarter of Dhanishta and ending with the last part of Revati, the time is held to be unsuitable for any kind of auspicious work. This period goes under the special name of Nakshatra Panchaka and when these stars are ruling, one should avoid journey towards the south, house repairing or renovation, collecting fuel and cattle fodder or acquiring cots and beds. Of all the twenty-eight constellations, the pride of place appears to have been given to Pushya, the 8th star. Good Informative article on Nakshatras; useful to budding Astrologers while making analysis of the charts. Thanks for providing lot of invaluable information in brief and in a clear manner, which can be understood even by a layman. very good information,who don’t anything about nakshatras. Simple and clear writeup which can be of help to both a budding astrologer or a layman. Very interesting article and a great read.By the way,is it possible to find our Ishta Devata using the Pada of the nakshatra or is through the Rasi of that particular Nakshatra. Hope to get a method that can help to find out our Ishta Devata. Do not understand the ‘overlordship of sun & moon’ bit. It is generally accepted that the position of Moon at time of birth determines the Nakahatra. If, say Moon is posited in any of the four padas of Satabhishaka, then the raasi is Khumba. Nakahtras are just further subdivision of f the twelve zodiac signs. The ‘overlordship of moon &sun’ bi somehow seems to imply that the raasi is based on Sun and Nakahatra on Moon! Nice presentation in a nutshell understandable by any person who wish to know about the Nakshthras. Good Article about Nakshatras, Would have been complete if Tarabala & relationship between Nakshatras would have been added. very good information for all about stars and its nature. highly appreciable and useful informations. Thanks. Shall we expect some lal kitab remedies in the simplest form. Sarva jana sukhino bhavanthu. The ascendant(the point on the ecliptic at which it intersects the eastern horizon at a particular time, typically that of a person’s birth.) is determined by the sun .the nakshathra by the moon..
very informative and makes the reade to browse more and indepth. please continue the same. The vedic science and technology is good but the real man who has knowledge for tracing up the knowledge without applied science of present technical development is essential. The vedic scholor is to be perfect one, is nothing is but TIME AND SPACE matching is the vedic science. All elipse i.e. moon, sun ghranam are telling perfectly. But the EARTH QUAKES telling place and time failing by any methods, like vedic, astrology, horscope, social science, technology one. But it is proved that the environment is too sultry our body is unrested and disturbance, varying mind. etc. similarly what happened in birds, it seems that the magnetic rays ways static current affect on earth by which our body affect the same, resulting small earth quakes only, that to near by areas. Environment difference within the state can find out by sudden changes. Here the planets movements is importent at that movement. In andhra pradesh mulugu panchayagam tole, lot of floods in madras before telugu uagadi and published panchgam, before by stating that madras lot of floods, rains. The vedic science is good. Take example of nemani panchagam, the rain dates almost all correct near about 90%. Why vedic astrologers failed for time, place, range of earthquakes in India, due to may be lack of knowledge only, but not vedic science. The vedic sicence is also through mathemetrics calculations. what is procedure/rules to be followed to send articles on astrology? I am researcher in vedic astrology since last 45 years. i am now 76 years. Many thanks for the highly informative and lucidly explained article on Nakshatras.